The key elements of the Heathrow (LHR) scheme is to bring forward by a year (to 2025) a suggested opening date for the new runway and a movement of this runway to a slightly more southerly location, reducing by 200 the number of houses needed to be demolished. The Grade 1 listed Harmondsworth Great Barn is saved, and the nearby St Mary’s Church. This latest proposal eliminates a plan to reconstruct the M4/M25 junction and takes the runway over the motorway which at that point will have 16 lanes. A 600m tunnel is envisaged. A total compensation fund of over £550m allocated for noise insulation and property compensation is proposed. This is more generous than previously suggested for a third runway. Proposed residential property compensation includes: 25% above market value for properties subject to compulsory purchase; stamp-duty costs on a new home; legal fees paid. A “Congestion Charge” would, it is suggested, reduce traffic. The Heathrow plan calls effectively for two entrance points to the airport, Heathrow East (in effect the old Central Area, now being rebuilt around the new T2), and Heathrow West, Terminal 5 with its northerly satellite named T6. T4 remains ‘as is’ and any decision regarding its future is a long way off. From a pure airline point of view the Heathrow and Gatwick ideas differ on why each airport exists. Heathrow is a hub and is focussing on long haul routes whilst also connecting passengers (in the main) to and from Europe. Gatwick admits to being, in the main, point-to-point, focussed largely on Europe, but happy to take the Heathrow overspill by opening up new long haul routes, mainly to South East Asia. Emirates to Dubai (three times daily) has been a success but Qatar Airways pulled its single service to Doha some time back. The essence of the Heathrow argument is that London was the centre of world trade for 350 years (the Port of London) but is now losing out as the “air port” of the globe. Unless something radical is attempted Heathrow (and the UK) will fall behind its rivals. Dubai has overtaken LHR as the world’s busiest international airport (although in truth over 80% of the traffic is connecting) and the major continental gateways are gradually catching up. The document shows that Heathrow is running at 98% capacity, Paris at 73%, Frankfurt at 70% and Amsterdam at 67%. With a third runway Heathrow’s figure would be 64%. Heathrow points out that it is the best connected transport hub in the UK. Already under construction is Crossrail and the plans call for a Western Rail Access, and also a Southern Rail Access including Waterloo as a gateway (perhaps the redundant Eurostar platforms). The proposal says that when complete 12m people will be within 60 minutes of the airport and by 2032 (ie with HS2 in place) Sheffield for instance will be just 1hr 25mins away with no changes (as against 3hrs 32mins presently with two ). Birmingham will be 53mins (one change) and is currently 2hrs 31mins with two. On a global map the presentation Heathrow focused on the Boeing 787 Dreamliner and its long range version. With this aircraft Brisbane, Hawaii and Santiago are capable non-stop. 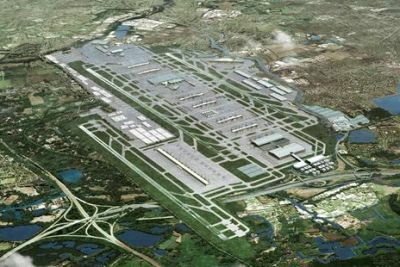 The Heathrow plans call for the redevelopment of the airport’s cargo facilities and will allows them to be doubled in size. This will allow for modern climate controlled warehousing, improved transit facilities and dedicated freight access points including the potential for a cargo railhead. John Holland-Kaye, Development Director and Chief Executive Designate of Heathrow said: “Expansion at Heathrow matters to the whole country. 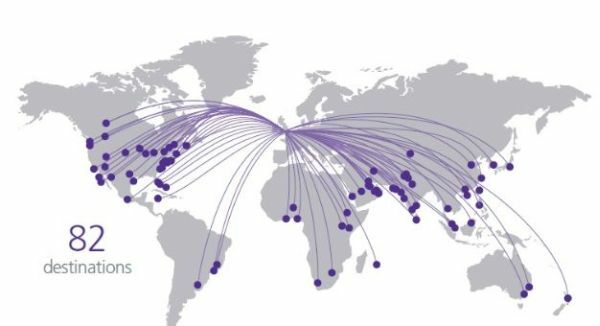 Only Heathrow will connect all of the UK to fast growing international markets. The plans we are submitting to the Airports Commission demonstrate major economic benefits from a third runway for the whole of the UK. “Expansion at Heathrow has national and local support. We have worked closely with local residents, listened to their concerns and improved our plans. Our submission reduces the number of properties that would need to be purchased and the number of people affected by significant noise. We would establish a fund to enhance local amenities and compensate residents more generously than previous UK infrastructure projects. British Airways was not represented at the briefing, nor any other airline for that matter. A pity perhaps. The new site for the third runway includes Waterside, BA’s headquarters. Next week we look at the Gatwick case.